The need to understand and protect the worlds oceans is becoming increasingly more important. As observational technologies advance and access to related data increases, the demand for low cost, high availability, unmanned platforms to host an array of observational and data recording sensors is increasing rapidly. Fulfilling the need for eco-friendly platforms and providing easy access to the acquired data is the mission of our company. Ocean Aero is a development-level company with a highly experienced management team that focused 2004-2011 on developing large, hybrid wind and electric powered Unmanned Surface Vessel (USV) platforms for the U.S. Navy. That effort produced three patents and a wealth of engineering and market knowledge. Ocean Aero represents the next generation – the creation of highly persistent, energy scavenging wind/electric vessels packaged in a smaller, man-portable configuration. The Company has designed a “game changing” highly ruggedized surface/sub-surface vessel, powered by wind and solar energy, capable of months at sea that can be deployed from land, sea or air. They have named it the “Submaran” – a new class of Unmanned Underwater, Surface Vessel (UUSV). Management plans to follow an aggressive IP technology strategy and, over time, introduce a number of variations of the base platform. The Company’s Base Case projections show revenues growing from $420,000 in 2013 to over $20 million in 2016 with a blended gross margin of 52% and cash flow exceeding 33%. The Company is seeking funding from a partner with industry knowledge that can help it develop go-to-market channels. We for-see a day when scores of these vessels will be deployed over the oceans providing essential information to science, academia, industry and government organizations. Using only the power of the wind and sun, our vessels will help the world better understand our oceans. 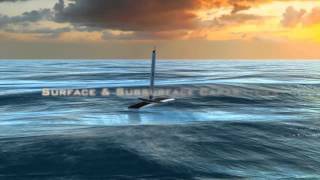 The Submaran UUSV is an unmanned robotic vessel designed for ocean observation, research and security apprications. The UUSV is capable of operating on the surface as a wind powered system and under the surface as an ocean glider. The UUSV product design is a highly ruggedized platform capable of surviving hurricane forces or being deployed from aircraft. Additionally, the UUSV will be capable of staying on mission for many months gathering and communicating data via various carriers and networks. It can be equipped with various sensors and information gathering systems. To reduce barriers-to-entry, Ocean Aero will offer turnkey, third-party operational services of our unmanned data gathering systems. The OA SaaS (System as a Service) will leverage the capabilities of the UUSV on a "rental" basis. SaaS will be marketed alongside UUSV platform sales so customers can make decisions based on needs and budget. SaaS terms of 15 days to one-year will be offered. Charges will include mission control, maintenance, sparing, and standard sensor configurations. Additional service charges include specific sensor configurations and launch & recovery. Management believes that non-competitive consulting opportunities will provide significant cash flow for the company in the initial years and significant licensing revenue is possible in later years. Ocean Aero will provide consulting services and integration design for entities desiring to combine its wingsail systems and technology with vessel designs of their own. We have identified a number of opportunities and are currently proposing consulting and design services. Professional Services will also be a key revenue component of and offered in conjunction with our OA SaaS. Mark has many years of experience as a multi-hull boat designer, builder and competitive sailor with extensive open ocean sailing and racing experience. Mark’s early creations were the starting point for the design and development of currently the world’s most sophisticated automated wing-sail assemblies and wind driven surface vessels. At Harbor Wing Technologies, Mark managed and coordinated all aspects of design, engineering and systems integration for a world class technical team under contract to the U.S. Navy.. The team’s research and development led to the creation of the world’s first primarily wind driven autonomous unmanned surface vessel. Under Mark’s direction over a period of 6 years the team successfully demonstrated to Navy program management several iterations of these multi-hull, wing-sail driven designs. Mark is the co-creator and inventor on several U.S. patents inspired during the Harbor Wing engineering process. Mark is co-developer of the UUSV concept. Ken brings to the company more than twenty years of executive business experience in developing and managing high-technology businesses. In his capacity as Executive VP of Business Development for Harbor Wing Technologies, he was responsible for shaping and delivering the company’s message to potential users of its technology, interacting with the media and financial communities as well as managing overall marketing and business partnerships. He was also responsible for intellectual property development which helped to produce three patents and several trademark registrations. His experience includes many years of working in marketing, management and business development for top Silicon Valley technology companies including Cisco Systems and Redback Networks. In addition, Ken has been involved in various projects ranging from product development and manufacturing to finance and merger. Bud began his professional career with a National Science Foundation including his thesis work in quantum mechanics and group theory of bonding in intermetallic compounds, molecules, complex ions and nuclei. He later worked for over eighteen years as a senior scientist with Scaled Composites LLC, solving problems such as aero-thermal analysis for SpaceShipOne (SS1) and SS2 boost and reentry thermal protection. He exemplified the dedication and leadership required for complex research, development and engineering over a broad range of aeronautical engineering, design, thermodynamic, molecular and material sciences. As principal of his own consulting practice, he designed the spacesuit-capsule interface, capsule life support system, electronics thermal control systems, and wrote mission simulation and control software for a balloon on ascent and parachute jump from 130,000 ft. for the Mission to the Edge of Space Project. Bud has authored a score of manuscripts and published writings. Prior to joining Ocean Aero, Eric was the Director, Defense and Intelligence Global Solutions for the geospatial technology leader Esri, were he lead his team to build awareness of Esri's geospatial technology within the defense and intelligence communities worldwide. Before joining Esri in 2010, Patten served as a US Navy Captain with a 25-year career of distinguished service. He was the Director of operations for the US Navy's Southwest region, responsible for shore-based operations including those supporting anti-terrorism, fire and emergency services, emergency management, and air and port operations. He served as navigator aboard the USS Ronald Reagan on several deployments including its maiden deployment to the Middle East in support of the global war on terrorism. Patten was the commanding officer of Helicopter Anti-Submarine Squadron Five One in Japan and has held several posts on a number of naval vessels. He has also led combat missions as a naval aviator.